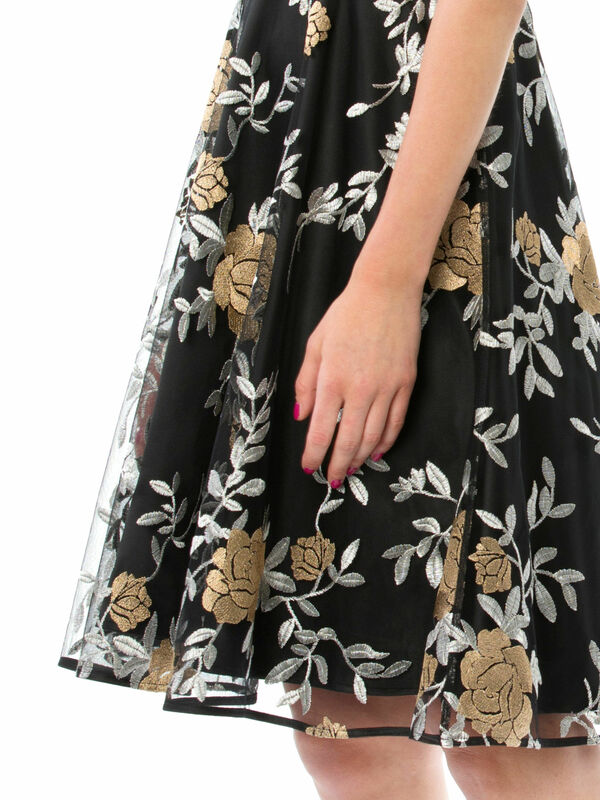 One Night In Florence Dress https://www.review-australia.com/au/one-night-in-florence-dress-black/RE19DR267.REBLK055.html The One Night In Florence dress in Black/Multi is sure to create memories that last. From evening wear to race wear, this versatile dress is sure to suit any special occasion. Featuring a high racer-back neckline, floaty mesh overlay and slight-stretch black lining. One Night In Florence Dress is rated 4.9 out of 5 by 42. Rated 5 out of 5 by anastasiastarz from A Dress for Special Events By random chance I came upon this dress instores, not having noticed it online. There was only one, and it was my size! It was meant to be. I'm a size 14 and it fit well, though the waist is a bit low (I'm short waisted, and overall short though), it's around knee length, work approved length. The colors are the same as in the picture. Being a halter neck style and of delicate fabric, don't wear a necklace with this one. A stapless bra or the use of those clips to pin the straps together and hid them is essential. Overall a lovely dress for a special night out, or trip to the opera/theatre. But not a casual theatre. Rated 5 out of 5 by motherann from absolutely stunning After years of being frugal and sometimes doing without it was time to buy some clothes that were stunning. So with the help of a friend who had done stage work we chose some dresses. He did say, 'I think this would look great on you, but will the budget allow for it." We decided to at least try it on. It looked great and so I bought it. First time I wore it was for my birthday, and I went out with a young man who thought I looked stunning. Rated 5 out of 5 by kristen91 from Sophistication at its finest I bought this dress specifically for a work function. I was initially torn between this and the sailor dress but the amazing lady at the store explained how this was a better fit. I ended up buying both dresses but I wore this one to the party. The compliments I’ve gotten about how pretty it was just overflowed even after the event has long finished. Rest assured that there’d be more parties I’d wear this to. Rated 5 out of 5 by Kimberly Jane from A dress that oozes class and sophistication I feel in love with this dress the minute I saw it. It is so beautiful and feminine. The colours make it easy to co-ordinate bags, shoes and jewelry. It is very flattering and also comfortable. The sizing is Review consistent. It is a dress that you will always come back to as you can wear it for many different occasions. I have received so many compliments with this dress. I just love it. Rated 5 out of 5 by pinkbandicoot from Perfect as an evening wear dress! I ordered this online as I have been eyeing it off and it came on sale, and I live over an hours drive from my closest review store. It is true to normal Review sizing and fits me perfectly! It is absolutely stunning on and will be perfect to wear to dinner for my husband's work we have coming up. Very easy to find shoes and bag to match as well. Rated 5 out of 5 by Sabrina from Love the halterneck design! I bought this for a wedding and everyone commented on how lovely it looks. I really like how the neck is higher as I am quite short and often find dresses too low cut for formal events. The colours look lovely together, I was a bit unsure when the Review girls showed me the dress on the hanger but I am so glad I tried it on as its beautiful on!